My first memory of bringing a trout to hand with a fly rod took place back in the spring of 1990. It was on a seasonal trout stream, located 45 minutes north of Atlanta, GA. It was a far cry from a trophy trout at 10-inches, but that freshly stocked rainbow trout, touched my eleven year old fishing soul to the core. I’ll never forget the excitement I felt watching that stocker chase down and eat my olive woolly bugger at my feet. It felt really good for a change, not relying on that plastic blue can of worms to get the job done. From that day forward, I never looked back, and I’ve moved on to become a respectable trout guide in my area and I’ve fly fished for trout all over the world. A lot of fly fisherman would laugh at me if I brought that fishing memory up in conversation. Many wouldn’t be able to look past the fact that I was fly fishing for stocked trout that weren’t naturally born in a stream or river. If you happen to be reading this post and you’re one of those fly anglers that I’m referring to, just remember that we aren’t all blessed to have easy access to wild trout. For many of us, wild trout populations are so low (because of poor conservation and land management), it’s not even feasible for us to strategically target them, and if it wasn’t for stocked trout, we’d have no trout at all. If you’re fortunate to be blessed with wild trout populations where you live, don’t forget how that special that is, and please don’t make fun or belittle others who take pride in catching stocked trout. You just make yourself look ungrateful and worthy of having wild trout. Before I get into my fly fishing tips for stocked trout, I’d like to take a moment to mention a couple of reasons I feel stocked fisheries can be good for the sport. For one, they’re a great place to introduce kids and newcomers to fly fishing for trout. Timed correctly, an angler with zero experience can have great success catching trout. Secondly, put and take trout waters provide great locations for anglers who like to harvest trout, to do so without having to illegally poach on special regulation or wild trout fisheries. If I knew I was going to be targeting freshly stocked trout (within a week or less of being stocked) I should really only need three types of patterns. The first would be a big Stimulator dry fly. Since stocked fish are conditioned to eating fish food pellets on the surface in the hatcheries, anglers can regularly take them on the surface with big dry flies. A dead drifted dry works really good, but sometimes, twitching or skating it at the end of the drift will also work. If the stocked trout aren’t liking your dry flies, I’d next try stripping a black or olive woolly bugger. A large profiled fly with an erratic action will really get the attention of freshly stocked trout, so much in fact, that they often will swim several feet to eat a big fly like a woolly bugger. And if the woolly bugger isn’t working I’d next rig up a tandem nymph rig and tie on a bright san juan worm or egg pattern off the back. Fluorescent colored flies are very hard for stocked trout to pass up, and they’re usually the ticket until most of the stocked trout have been landed on them multiple times. 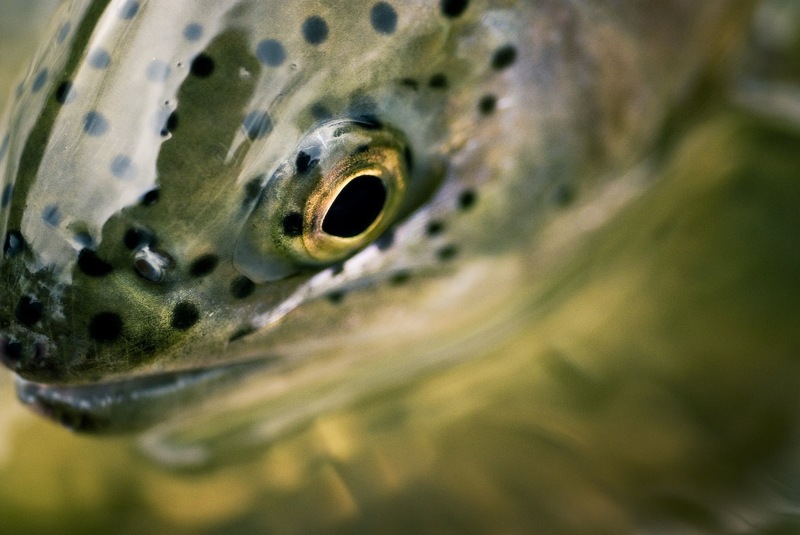 Try these tactics above for freshly stocked trout. Don’t always think the fun is over after a few fish. Many anglers move on to new water when all they need to do is change out their flies to something different to continue to catch stocked trout. This works really well when you’ve got crowded water and equally well when you’ve got kids that aren’t very mobile. When trout are first stocked they often search out slower moving water. I think most of the time this is because they’re trying to match the slow moving water that they grew up in at the hatcheries and it’s more comfortable to them. If you know the DNR recently stocked you should first check out the pools and deeper slow moving runs and bypass the fast moving pocket water. These places you should find pods of trout hanging out and easy to catch. Eventually stocked trout will get conditioned to seeing those big woolly buggers and bright attractor nymphs, and you’ll find it much harder to get them to eat them. When that happens, anglers should start fishing fly patterns that are more natural looking and less gaudy and flashy. This is the time that soft-hackles and your traditional nymph patterns (prince nymph, hares ear nymph and pheasant-tail nymphs) really shine. I often will tie on a fast sinking copper john and drop one of the traditional nymphs off the back. The longer the stocked trout have been in the stream or river, the more they will start to spread out and move around. This is when I’ll leave the big pools and runs for other anglers and focus my attention fly fishing the pocket water and seams of riffles. You’ll find the trout here less pressured, easier to catch and you should also be able to find some water to yourself. If you’re on the water and you can’t get the stocked trout to eat your dead drifted flies, try repositioning yourself so you can swing your fly patterns in front of them towards the end of your drift. Sometimes, this can be the most effective way to catch stocked trout that have been in the water for a while. Over the years, I’ve witnessed and fly fished to stocked trout that were unbelievably difficult to catch. Some of these stocked streams get pounded daily with anglers, and eventually the trout get super spooky and selective. When I see this on the water, it makes me want to round up all those stocked trout haters that think all stockers are a joke to catch and watch each one of them get their egos checked. If you’re going to be fly fishing for stocked trout late in the season after they’ve had lots of education, you should be ready to downsize your tippet, micro-nymph, and fish tiny dry flies if you want to consistently catch trout. Yes, I’m talking about 6x-7X tippet and fly patterns down to size 24. That’s some of my tips for fly fishing to stocked trout. Please drop me a comment if you have any to add. This entry was posted in Fly Fishing Tips & Technique, The Hot Ticket, Trout Fishing and tagged Fly Fishing, fly fishing blog, fly fishing for stocked trout, Fly Fishing Tips for Stocked Trout, Gink & Gasoline, Gink and Gasoline, how to fly fish, Kent Klewein, Louis Cahill, tactics for stocked trout, trout fishing by Louis Cahill. Bookmark the permalink. Stocked trout are suicidal on stocking day. They get progressively more difficult to catch thereafter. Stocking day is a great day to get a young kid excited about catching (v. fishing). Kent, as a guy that grew up chasing stockers in all the north Georgia streams, your tips are spot on! The only thing I would add is don’t be afraid to walk 100-200 yards up/down stream from where they were stocked when the crowds following the stocking truck shows up! My dad and I had great days because many people only hit the easy holes near where they are stocked and are too lazy to walk a little ways for trout. My first memories of fishing for trout were the same. A stocked river can of worms and what seemed like 500 people lining both side of the the river. Fortunately now I live on an area with a healthy population of wild fish, these tips I feel still ring true early and late seasons before and after the fish have been beaten up all summer. As well as my local tail water that gets a planting or two a year of stockers. Thanks as always for the tips and articles! Nice article. For the 30 years I lived in Southern California, the local fishery was a gorgeous little stream called the San Gabriel, with three branches. In the west fork, it was stocked for the first mile of six miles above the split. Much the same for the east fork. The stream emptied into a large reservoir, containing rainbows that were said to be of a steelhead strain; they ran up into the creeks and tributaries to spawn every spring, and moved back into the lake afterwards. It seemed to me that they took along larger native trout over a couple of years age on their return. Thus the fishery was a mixture of stocked, wild, and holdover trout. Most of us fished them as though they were wild, and that worked well. But, we had to be satisfied with smaller fish except for spawning time. The drought in the 2000s emptied the lake and was very tough on the trout. I moved away to Texas ten years ago, but have fond memories of tall the days on those waters. When I was a kid, my uncle who was a guide would take me to places the DNR had just stocked with “pellet” flies tied with brown craft foam. We would slap them on the water and those fish couldn’t resist. It got me hooked! Great info you have shared here. One thing I want to ask about trout fishing. As you mentioned above that trout always found in crowded water, Ya it often happens but not regular.